Hakusan, Japan, September 28, 2017 – EIZO Corporation (TSE: 6737) today announced the release of the FlexScan EV2785, its first 27-inch 4K monitor and one featuring a frameless design and USB Type-C connectivity. The 27-inch monitor has an Ultra-High-Definition (UHD) resolution of 4K (3840 x 2160 pixels), for a super fine pixel pitch of 163 ppi. This gives images and text great sharpness and clarity, while providing a large working space in which to run multiple applications. The FlexScan EV2785 uses USB Type-C, where a single cable transmits video, audio, and USB signals and supports a super speed transfer rate of up to 5 Gbps. In addition, the FlexScan EV2785 can supply up to 60 watts of power for recharging notebook PCs and other devices via one USB Type-C cable, eliminating the need for separate power cables. The clarity of images and convenience of USB Type-C makes the monitor perfect for conventional office and CAD use, as well in ‘free address’ offices where workers frequently move around. The monitor has a virtually frameless design with 1 mm bezels on the sides and top and 5.8 mm on the bottom, making it perfect for multi-monitor environments and distraction-free viewing. It comes with a unique space saving and ergonomic stand with 178 mm height adjustment and 344 degrees swivel. An attachable cable cover and cable holder also come with the monitor, for storing cables neatly behind the monitor. An optional stand bracket (PCSK-03) is available for attaching a thin client or mini PC to the back of the monitor without affecting stability or movement. The cabinet comes in either black or white with matching cables, and features a new speaker design. With previous frameless models, the speakers emitted sound from the back of the monitor due to the housing design. 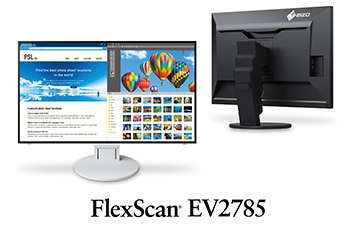 With the FlexScan EV2785, they emit sound from the front while maintaining a frameless design for clearer, more direct sound without distracting people sitting behind the monitor. EIZO’s proprietary software Screen InStyle lets users assign a preset mode to applications and adjust the circadian dimming and power settings of one monitor or all monitors in a multi-monitor setup. An additional feature allows switching of the monitor inputs using user-defined hot keys rather than the switches on the front of the monitor. A server app for Screen InStyle gives an administrator control over the settings of all EV2785 units in an installation from a central location. This is especially helpful for enterprises that want to ensure all units are adjusted properly and the power-save settings are activated. Date of availability varies by country so contact the EIZO subsidiary or distributor in your country for details. *Ambient illuminance must be more than 500 lux (typical office environment) and viewing distance more than 35 cm. All product names are trademarks or registered trademarks of their respective companies. EIZO and FlexScan are registered trademarks, and Screen InStyle is a trademark of EIZO Corporation.